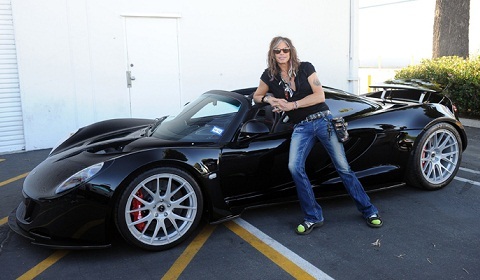 Steven Tyler, perhaps best known as the lead singer of Aerosmith, has taken delivery of the first Hennessey Venom GT Spyder. 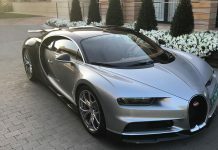 We reported last month that Tyler would take delivery of the supercar to coincide with the season finale of American Idol Season 11 on May 23rd. His Venom GT gets a black exterior with black interior and contrasting red stitching and a custom audio system constructed by JL Audio. 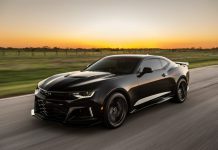 The Spyder is powered by a twin-turbocharged Chevrolet LS-series aluminum V8 producing 1,244hp and 1,135lb-ft torque mated to a six-speed Ricardo manual transaxle. The Venom is capable of hitting 100km/h in about 2.2 seconds. 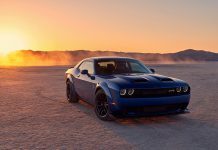 Top speed will be slightly less than the Coupe’s 262mph. Stopping power comes from 15 inch, six-piston front and four-piston rear Brembo carbon ceramic brakes. The price is a considerable $ 1.1 million. You’ll notice from the specs above that the power is slightly up for the Venom GT Spyder. Hennessey added around 30lbs of weight making modifications to allow the roof to be removed, the extra power is their way of compensating! This could be the second from last Venom GT. 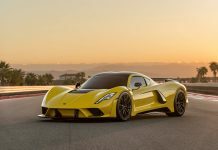 Hennessey only planned to build five examples, four have now been delivered leaving the fifth example still waiting to be built.